Disclaimer: Zach temporarily loaned me a review pair of the Verite with no stipulation I write a review. My preferences lean just slightly warmer than neutral. My reference chain of gear consists of: Arcam CD Player -> Yggdrasil A2 -> ZDS -> Auteur / Atticus / HD800S / HD6x0 family. ZMF Headphones is a small shop, boutique headphone manufacturer. Every headphone is made by hand by Zach himself and a few associates under his employ. The ZMF Verite is the 5th design created entirely in house (his earlier planar designs were extensive modifications using the Fostex T50rp driver). It is released alongside the ZMF Aeolus, the much rumored open back version of the ZMF Atticus. The Verite uses an entirely new driver made from beryllium, not seen in any of Zachs past headphones. Unlike some other headphones that uses a beryllium design, the Verite uses a beryllium coated PEN driver. He felt this made for more natural tonality over a pure beryllium design. At $2,500, this is ZMF's most expensive headphone to date. Lets see if it can live up to its lofty price. Every one of Zachs dynamic headphones from the $999 Atticus to the $2,500 Verite exudes quality. From the all metal and leather frame to the plush leather earpads to the exotic wood cups. You know that a considerable amount of the money spent is going towards a genuinely well made and beautiful product. While in the end it is the sound that matters most, it is nice to be able to have the brains and beauty we should expect at these price ranges. Specific to the Verite, it comes in a magnesium chassis to help save on weight (It seems this can be an option on the Aeolus for an extra cost). It also looks nicer than what I assume is aluminum on the other models. The stock wood is Silk Wood, while the current limited edition wood on offer is Pheasantwood for an extra cost (these limited woods cycle out as Zach gets special wood stock in). The Verite I have for review is made of Mahogany, which I am told sounds almost indistinguishable from the stock Silk Wood. Comfort is excellent. At 430g the Verite is the lightest ZMF to date. While 430g can still be heavy compared to lightweight headphones like the HD800 (330g), it wears its weight very well thanks to the suspension headband design. I can wear these for hours without discomfort or hotspots. The overall tonality of the Verite leans on the warmer side. It has a very slight W shaped response. Close enough to warmish/neutral that I think most will find agreeable. While this is definitely a colored headphone, do not mistake that for a lack of detail. This is clearly a reference headphone. It can easily compete with the HD800S and even the Utopia. It is a well rounded headphone, usable for a multitude of different genres. Below I go into more detail as well as include some comparisons to other headphones. Deep, powerful and well controlled. Sub bass on the Verite extends quite a bit for an open headphone. I have heard closed back headphones that had bass rolloff before the Verite. The bass as a whole is fast and tight, not unlike a planar. It is slightly elevated from the upper mids and peaks in the lower mid bass/upper sub bass. Usable bass response down to 20hz. The bass drops in Doin it Right by Daft Punk hits with authority. Very little to no bass bleed into the lower mids. Compared to the Auteur, the Verite is faster, deeper and better controlled. Quantity is about the same. I can say almost the same compared to the HD800S (much faster, deeper, about the same with control). The Verite also has noticeably more in overall bass quantity than the HD800S. Linear and revealing up until the upper mids, which is slightly recessed. I must emphasize slightly. This is nothing like the deep crevice that is the Focal Elear or many Audeze LCD models. I think this may actually give the soundstage just a bit more depth than it would otherwise. It does take away a small amount of guitar crunch for you metal heads like myself. Not enough that makes this a poor choice for metal, but it is noticeable when comparing to something like the Aeolus or Atticus (the definitive headphones for metal imo). Mids overall have excellent clarity just slightly on the lush side. Full and dynamic. Vocals sound natural, neither forward or recessed. Compared to the Auteur, the Verite mids as a whole are slightly less lush, but more revealing with better micro dynamics and more noticeable changes in volume rises and falls in the music. The Auteur is a bit more lively in the upper mids. Compared to the HD800S, the Verite is fuller, less lean and more engaging. Micro dynamics are about equal, the slight graduations in volume easily heard on both. These are two very highly competent headphones on a technical level. Treble extension is impressive to say the least. The Verite manages to capture air while simultaneously staving off fatigue. The highs are more present than any of Zachs previous headphones, which is quite a departure, even more so than the Auteur which I considered a departure when it released last year. There is a slight peak around the mid treble but it is masked well, especially with the Universe Pads. Treble is smooth, despite it having a little more quantity than previous ZMFs. Some people may find it to be too much, but this will come down to preferences. The Verite is NOT a bright headphone by any means. Unlike some other beryllium headphones I have heard, there is no metallic sheen to the treble. Likely due to Zachs use of using a PEN driver coated in beryllium, rather than using pure beryllium. Compared to the Auteur, the Verite has more quantity, but is smoother overall. The Auteur could sound just a smidge rough depending on gear. Treble extension is superior on the Verite. Compared to the HD800S, the Verite is also smoother, with quantity being about on par. The peak at 6k on the HD800S is still quite noticeable. Combined with the thin sounding mids which play a contributing factor, the HD800S on a whole just sounds brighter. For a headphone, the soundstage is good. About as good as it can get before you get to ultra wide, defuse soundstages like those seen in the HD800S. 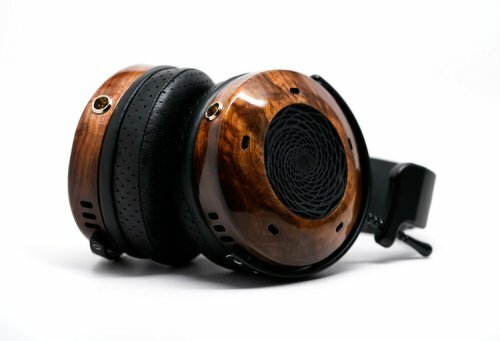 So while the HD800S may be wider and deeper, the Verite sounds a bit more natural for a headphone, which I think the wood may play a factor in. About on par with the Auteur, maybe just a little wider. Imaging is precise and pin-point on all three of these headphones. I know many (including myself) were curious to know how these compared to the Utopia. Both are statement products and the top of their respective lineups. I didn't include the Utopia in the main comparisons because I didn't have one on hand at the time I had the Verite to do direct A/B comparisons (so take the following with a grain of salt). I still wanted to say a little something though since I did have a Utopia for an extended loan awhile back. In short, I prefer the Verite. I don't think it is an overall better headphone, but is an overall better headphone for me. They are about equal when it comes to technicalities and micro dynamics, which is an impressive feat considering the price difference. The main difference being in the tonality of the two headphones. While the Verite leans a little to the warm side, the Utopia leans just a smidge to the brighter side. The Utopia also has a slight metallic sheen to it that some (including myself) find annoying. I think this is a huge advantage to Zach using a PEN driver coated in beryllium vs a pure beryllium design. Preferring one over the other is going to be a personal decision based on each individual listener. I want to single out the Auteur for a brief moment. Many are asking if the Verite replaces or is better than the Auteur, which only came out a year ago. Zachs official stance is that it does not. I was a bit skeptical of his answer until I heard the Verite myself, which I now agree with. To expand on the comparisons I made earlier in this review, the Auteur, while not as technically proficient does lend itself to a more linear sound. It is still a warm headphone (probably even more so than the Verite even) but rather than a slight W shaped FR, it is a bit more linear throughout. It also has a bit more addictive, lush sound that some may prefer. Personally, I will not be selling my Auteur. It is one of my favorite headphones I've owned and the Verite doesn't change that. I am seriously considering buying a Verite to add to my collection, rather than replace any one headphone (if it does replace anything, it will be my HD800S). Up until now, all my impressions are with using the Universe Pads, which Zach prefers and may be even shipping as the stock pads. The Verite pad tips the overall FR balance and elevates the treble. The mild mid treble peak becomes not so mild and the headphone overall is a bit brighter and forward sounding. I did not care too much for the Verite pads. I think people coming from the HD800 and Utopia may enjoy it a little more. I've become acclimated to the warmer sounding Auteur over the last year and prefer the Universe Pads. Bass and mids remain largely the same except the very mild upper mids recession is a little less recessed. More than any other ZMF headphone, the Verite scales like mad with higher end gear. Do not take this to mean you need to spend big bucks on gear to get a good sound. The Verite sounds great, even from the $99 Fulla 2 or my Vali 2/Modi 2 stack. Moving up to my Yggdrasil and Eddie Current ZDS is a noticeable change though. Increased dynamics, clarity and plankton across the board. The Verite is a headphone you can buy for your entry level gear and get great enjoyment from it, then have some fun building your dream system around it. ALWAYS buy the headphone you want first. Don't worry too much about the gear you have at this exact moment. Personally I have always preferred tube gear. I think they provide better dynamics, micro detail and more realistic sounding highs. However the Verite will of course sound great from solid state gear as well. I'd just urge those who are curious, if you are going to buy a new amp, look at some tube gear. I particularly like Schiit on the cheap end (Vali 2 is ridiculous value at $150 and pairs great with the Verite), and Eddie Current and Donald North Audio on the higher end. I have also heard a couple Amp and Sound amps with Zachs dynamics and liked the pairing as well. I know Zach now has his own Amp and Sound collaboration amp called the Pendant that may be worth checking out. As always with these super expensive amps (and headphones for that matter), try making it to a local meet to hear these for yourself if you can, I know that may not always be possible for some depending on your location though. I think at this point, value as in price/performance is out the window. Normally I would balk at a headphone breaking the $2k mark. I was disappointed in the new HD820 pricing and Hifiman continues to dupe its customers into buying headphones made of $100 in materials for thousands of dollars. The later headphones I mentioned however are mass produced in a factory. Some using cheap plastic parts even. ZMF headphones are boutique, hand crafted headphones using very high quality (and sometimes exotic) materials. These are not mass produced on an assembly line. ZMF is a small business run by Zach and his wife Bevin along with a few helpers. From a financial standpoint, these headphones cost so much likely because they HAVE to cost this much. A bunch of shareholders didn't just slap a random price on there to get as much as they think someone would pay for them. The Verite is an excellent headphone that matches and sometimes exceeds headphones in its price range and above. Zach also has many cheaper headphones. His ZMF Classic is an excellent price/performance value at $299 for example. The Verite is expensive, an understandable reality of economy of scale. The Verite marks a milestone for ZMF as a brand and is a worthy statement product. I think fans of ZMFs house sound and newcomers alike will be in for a pleasant surprise. It uses a new driver tech for the ZMF lineup, offering a new take on the ZMF sound. Well rounded sound for just about any genre. Priced at $2,500 it is expensive, but it does really feel like we are getting a great product for our money. Just don't sell your car or go into credit card debt to buy one, some things are more important than headphones (blasphemous I know). WHO23, zach915m, Malfunkt and 6 others like this. The Vérité is the new ZMF flagship, and is being released as one of two new entrants into the company’s open-backed, over-ear dynamic lineup. The Vérité brings several technical firsts to ZMF’s headphones, perhaps most excitingly, an entirely new driver material, comprised of beryllium deposed onto a polyethylene naphthalate dome. Other improvements include a magnesium chassis, a stiffer surround, porting along the edges of the cups, and a 50 gauss magnet. These changes are all in service of two goals: absolute control over the driver’s behavior, and comfort. As the new top offering, the Vérité has a tall mountain of previous ZMF successes to climb. To be clear, however, Zach has stated that the Vérité is not meant to overshadow the Auteur as the “best” ZMF open-back headphone, but represent a new level of technical refinement, transparency, and detail, with its own take on the ZMF house sound. Bearing all of this in mind, I was very excited to get my hands on a Vérité for review, and hope to provide useful information for the community, especially given the current pre-order period. For this review, I will be running all headphones through my Oppo HA-1, serving both as a DAC and as a headphone amplifier. Music will be run to the HA-1 via USB out of my custom-built PC, through Spotify Premium. I don’t listen to FLAC for the bulk of my music, and I am most familiar with the tracks to be mentioned, so they will be my reference. The highest quality in Spotify was selected, and volume normalization was turned off (the settings I always use). Volume across headphone comparisons was matched as much as possible during pink noise playback, with a BFX digital sound meter sealed to the headphone cups in a cardboard enclosure. All headphone cables used were OFC 4-pin XLR, plugged into the balanced output of the HA-1. I listened to the Vérité with the Universe pads for the bulk of this review, but switched in the Vérité pads as well. My impressions of the Universe pads versus the Vérité pads can be found in their own section. I will be comparing the Verite to the ZMF Auteur, ZMF Aeolus, Sennheiser HD800, and Stax SR-007 mk1 (amplified by a Stax SRM-353X). All of which I own, and have listened to for a few months at the least (except the Aeolus, which is also here for review). I will be comparing headphones primarily across these, but also other tracks. I don’t make mention of every track in every section where I listened to them, but instead am largely giving my high-level impressions. If you want my thoughts on any particular track or phrase, just ask! I’ve tried to select widely available songs across a spectrum of music that I like and am familiar with. As anyone who has ever held a ZMF headphone can tell you, Zach’s build and design is at once robust and sculptural. The Vérité is no exception, and now takes the prize of being the lightest headphone that ZMF offers, at around 430 grams, courtesy of the acoustic porting of the cups, and new magnesium chassis. With the open-backed (read: ventilated) design, plush pads, and the double suspension system, comfort is exceptional. For those unacquainted, ZMF headphones use a spring-steel band wrapped in padded leather, with a thick leather suspension strap below, to evenly distribute pressure. The cups on the Vérité I have with me are a striking oxidized mahogany, although I do not know if that will ever be one of the production woods. The stock Vérité will be run in silkwood, and the first limited edition in pheasantwood. 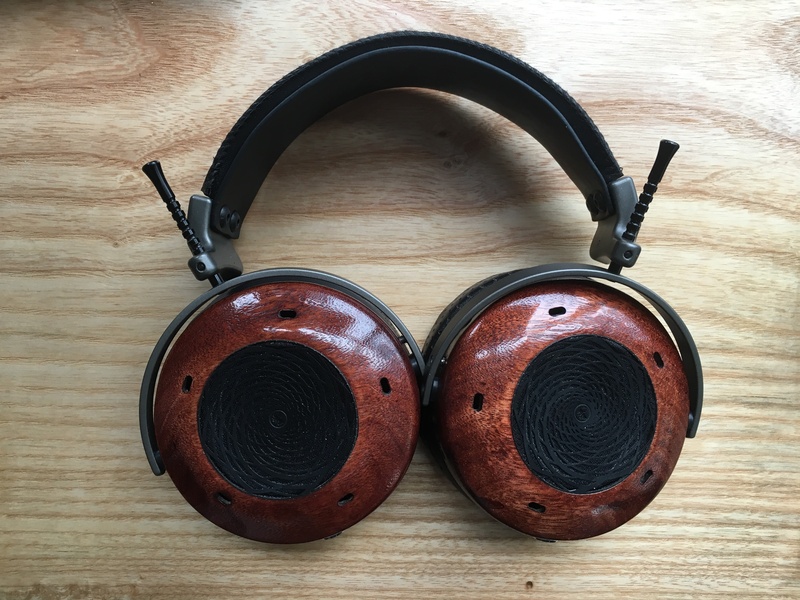 The adjustment sliders on this headphone have been updated slightly from the rest of the ZMF open-backs, featuring a dished, rather than a rounded top. The grills are a beautiful addition to the presentation, and will be offered in a few finishes, depending on wood species and customer preferences. The pattern on the grills takes inspiration from the golden ratio, and along with the sloping wood cups, gives the headphone a refined and artisanal look and feel. Speed and precision are the first words that come to mind when describing the technicalities of the bass I heard from the Vérité. Transient response of bass notes is among the best I’ve experienced, I believe largely due to the self-damping properties of beryllium. Moreover, when a bass-heavy phrase presents, I do not hear bloom, or just that there are some bass notes playing, but resolution of each note and beat, easily placing instruments. In Limit to Your Love, by James Blake, around the 1:50 mark, the separation between each component of the bassline proved a great example of this ability. However, it is not impact that makes this reproduction so convincing. The finesse with which the Vérité differentiated the timbre, placement, and impact of low frequency sounds was perhaps it’s greatest achievement in this area. I soon realized that if I wanted to fairly judge the bass capabilities of this headphone, that I would need to listen to a lot of different music. The Vérité is not tuned to make your ears pulse endlessly, unless the material it is fed demands exactly that. As I spent more time with the Vérité, it became abundantly clear that songs that I had in the general mental category of “physical bass presence”, could not all be grouped together. Most songs have a bass line of course, and reproduction was adept across the board, but the Vérité helped me more precisely draw the line between songs with impactful, textured bass, versus those that just had low frequency notes. Bass extension was excellent, although there was a very gentle uptilt from the sub-bass through the mid-bass. Mid-bass does not bleed into the lower mid-range, and maintains an even hand throughout. Bass in general is slightly elevated, but it is hard to say to what extent exactly, as the increase in detail may be leading me to notice the bass as more present, and more authoritative. The tuning of the bass overall is relatively flat, given that this is a dynamic driver headphone (that is, only a gentle rise into the mid-bass). More importantly however, the tuning makes way for the technical excellence of the driver to shine through, making the bass feel much more taut and impactful than would any particular bass frequency-band emphasis. The mid-range of the Vérité is again fast, as well as quite transparent, and on the more dry side in the lower mids, at least compared to other ZMF headphones. Depending on the song, this can come across as either an exceptionally clear window into the mix, or the realization that recordings have a bit less meat on their bones than you remember. Put another way, the mid-range, especially with the Vérité pads, focuses on textural accuracy over smoothness. I’m still unsure whether this is due to exceeding transparency, or the timbre of the Vérité, but I expect that some of each is at play. Regardless of the explanation, this specificity in reproducing the texture of notes, led me to hear many songs in a new light, demanding a fair amount of listening to better understand what I was hearing. This “newness” was not so much the experience of “I’ve never heard that rustle/instrument/fart before”, but, “I didn’t realize that there was a level of inconsistency between notes, and a texture to each that was previously just not being noticeably resolved.” This effect is not unique to the mid-range, but it is the first place I noticed it. The upper end of the mid-range/lower treble shies away from the drier feel of the lower mids, and slopes up in perceived fullness, while maintaining exceptional clarity. In general, well-recorded music with detailed mids are masterfully rendered by the Vérité. However, as we’ll soon get to with the upper treble registers, poor quality music is not the greatest pairing with this headphone. Perhaps the most concise, and in retrospect, comically obvious way to put this, is that the Vérité tells the unapologetic truth. The treble reproduction of the Vérité is honestly a stroke of brilliance. I’m not saying this because of any one track, or because I think the frequency response is the closest to the Harman target, or something like that. No, the reason I think that what Zach did is so clever is because rather than create an artificial sense of clarity through peaky or broadly elevated treble, he let the timbre and speed of the driver convey a sense of treble presence. This approach avoids adding energy that can contribute to driver resonances, sibilance, and harshness, without giving up the perceptual effect of a transparent and airy high end. Treble notes are presented with immediacy and superb texture. Importantly to me, the treble lacks any perceptible veil, which I feel plagues a majority of headphones, even some of the brighter ones. That said, there is some elevation in the upper treble that can sound a bit sharp on some lower-quality tracks. However, on well-recorded music, this tuning choice gives a sense of space and quickness to music, which I really appreciated. Listening to a few fast-paced Vivaldi pieces, for example, with violins sawing away in their upper octaves brought no pain, but presented nicely separated layers of notes. On less well-recorded music, the Vérité continues with the pattern of being fast and transparent, although sometimes to less pleasant effect. I was recently listening to the new Lil Wayne album, which, while a great throwback to his 2005 achievement, is not the most carefully recorded work. In Mona Lisa, “s”s “ch”s and “t”s from Lil Wayne’s mouth bridge that line between, “Wow, I can hear air moving past the grills on his teeth”, and “my ears do no like this, use other letters please”. At lower volumes, this wasn’t very noticeable, but I don’t often listen to his music softly in the background. After the first time listening to the album, I switched over to the Aeolus, which smoothed things out just enough for me to enjoy my guilty pleasure. All told, the treble of the Vérité is so thoughtfully crafted, but if your source material is sharp or glaring, the Vérité is not going to sand things down for you. I do expect that if I had a higher-end tube amp, that could be a big help in this regard, as the HA-1 can lean bright at times. I have a Vali 2, which I have enjoyed tube-rolling while reviewing the Vérité, but it is not an amp that can match the Vérité in resolution, to say the least. This is the section where preference and subjectivity goes out the window as much as it can in this hobby. In the past three sections, I imagine you were reading to see if the tuning of the Vérité would be up your alley, as that matters a lot in choosing a headphone. Or maybe you're here just because this bleeding-edge gear is drool-worthy. Thanks for reading this far in either case. What I will tell you here is this: if your reference is any other ZMF headphone, or 99% of the rest of dynamic headphones in the world (definitely underestimating here, if we are talking all headphones), the Vérité is better in all, or nearly all technical regards. The Vérité has more precise imaging, a more stable stage, with a sound field that feels tailored to each song in size and dimension, and has a noticeable holographic quality...It’s just better. Unfortunately, I do not have a Utopia on hand, as another well-recognized king in these areas, but I do have some mk1 SR-007s, which I have used as a benchmark for speed and specificity (alas, no 009, either). We’ll get to that comparison in a bit. While there are certainly competitors on these fronts that mean I can’t name an absolute winner without all headphones in hand, in my opinion, the Vérité is world-class across the board in its technicalities. To give a bit more concrete description to my experiences, in several songs, I noticed that what I had previously believed to be left-right panning of a sound actually involved a very subtle front-to-back effect, such that notes were tracing an elongated ellipse around my head, or moving along a shallow diagonal (see around 00:26 in 100 Grandkids, or the opening of Crosstown Traffic, for example). It’s not so much that these effects can’t be heard on other headphones, but that the Vérité provides the space and clarity for such details to pop. Specificity of instrument placement is very stable, as well as precise on the Vérité. Listening to Silver Droplets, by Made in Heights, each note from (what I believe is) the glockenspiel, hovers in the air above the female lead, separated from each of the other strikes. The instrument later reappears to the right, after playing center-stage in the introduction, and rotates behind the head-stage slightly over time, something that I had never before noticed, but which was glaringly obvious on the Vérité. The soundstage can grow, shrink, and change shape when called for. This point, of song-variant soundstage size and shape, is perhaps more critical to take note of than absolute stage size, which is already larger than any previous ZMF headphone. Unlike some headphones, soundstage isn’t as obviously a feature of, or constrained by the driver or enclosure, but rather is rendered as called for. The Vérité can easily project well outside of my head along all three axes, however the image that is projected tends to be larger from side-to-side, and on the front-to-back axis. The vertical presentation of space is noticeable, but extends less in absolute terms, compared to the other two dimensions, however, vertical space does scale just as dynamically. This could be a feature of common recording practices, but I am not certain. Finally, it is worth noting that when recordings are silent, either overall or in one area, the Vérité projects inky blackness that is damn satisfying, and really deserves to be heard. The physical differentiator between the Universe pads and Vérité pads is a slight angle at the rear of the former. The Vérité pads lie flat against your head, presenting a few noticeable changes. First, your ear is closer to the back of the pad, or in my case, touches the back of the pad. This was not the annoying kind of occasional brush, but more just light contact with the tops of my ears, which I don’t mind, especially in open-back headphones. After switching to the Vérité pads, I also had to reduce the rod extension by one notch, as the flatter profile absorbed less of the rod height than did the angled Universe pads. The most noticeable sonic changes with the swap to the Vérité pads were a slight but inconsistent increase in energy from the middle of the mid-range through the mid-treble, more bite to the general timbre, and a bit more focus and narrowing of the soundstage. The stage did not become small by any stretch, but there was a tilt inward. Overall, I think I prefer the Vérité pads, for they support what the Vérité is best at: being incisive, resolving, and dynamic. The Universe pads are a great option, and provide a little bit of mellowing and space that would certainly pair well with some genres, and allow for more relaxed listening sessions. The most immediately apparent difference between these headphones is in separation and texture. The Vérité does a better job at picking apart the mix, giving space and resolution to each component, without sounding artificial. To be entirely clear, the auteur was no slouch in this department. However, the new Be driver brings a level of transparency that the auteur can’t match. The soundstage is larger, and more clearly defined as well on the Vérité, which again, is not a department where the auteur could be seriously faulted, but where there was room for improvement that the Vérité thoroughly fill out. Transient edges of notes have more texture on the Vérité, are better defined, and more tightly controlled. Mids are the foundation of almost every ZMF headphone, so we’ll begin comparing tuning there. The mid-range, especially vocals, are smoother and sound more musical on the auteur. On the Vérité, the extreme clarity of voices makes music played in the background ask for your attention. So much detail is presented, while pulling away the veil of recorded music, that I found the auteur to be the better headphone for background listening (and the Aeolus better still). While the effect of directing my attention back to the music was not forceful, it was not easy to ignore, either. The tension between absolute transparency and musicality is an eternal struggle in high-end audio, and I believe that Zach has displayed real thoughtfulness in just where he drew the line for the Vérité. Music does not become fatiguing to listen to, as can be experienced with many “detail-head” cans, but neither did he make any appreciable compromises in resolution for the sake of easy-listening. To be fair, most people investing over $2,000 in a headphone are probably not prioritizing how easy it is to ignore, but who knows. Again, I really think this comes down to the confluence of the measurably somewhat dark tuning of the Vérité, coupled with the absurd speed and specificity of the Be driver. Treble is more transparent and faster on the Vérité, as compared to the auteur, with effects like the vibrato of the chimes in Boomerang presenting as both richer and more apparent. The slight sheen that I sometimes felt needed to be polished off of the auteur treble is also rapidly dispensed with by the Vérité. This change brings clarity, without depending on shoutyness or glare. Despite this improvement in resolution, the more even overall tuning of the auteur’s treble conveys a sense of naturalness, which I very much appreciate. Bass is tighter and more textured on the Vérité, and a touch elevated above that of the auteur. To that final point, the auteur does have the technically more neutral tuning of the two. The Vérité does not present as distractingly colored, but compared to its sibling, which is the closest -to-neutral headphone I have spent any real amount of time with, the slightly down-sloping tuning is noticeable. To be fair, this comparison was done with the Vérité’s warmer pads, and the auteur’s more neutral, so if there is interest in me making a change in either/both directions for comparison, I would be happy to oblige. If you read my auteur review, you know that I basically concluded that the auteur offered a more intimate presentation than the HD800, without giving up much in the way of detail retrieval, all while feeling dramatically less forced, and more musical. The Vérité, as you might then imagine, gives you the best of both worlds, and more. Compared to the Vérité, the HD800 feels thin, and does not achieve enough through its marginally wider soundstage to justify the victories that the Vérité wins in speed, richness of detail, bass quality and quantity, mid-range naturalness, or lack of sibilance. To be fair, the HD800 is less than ½ the price of the Vérité, and is almost a decade old, but as a stalwart of the audiophile’s stable, I believe that the comparison is warranted. In addition, the HD800 still does present a remarkable tool with which to dissect music, providing ample space, and making no attempt to distract. The HD800 is also remarkably comfortable and light, and as one of the non-ZMF headphones in this comparison, its build is worth noting. Unfortunately, ergonomics are the only place where the HD800 challenges the Vérité, as in terms of durability, material quality, and (subjectively) aesthetics, it gets absolutely stomped (and covered in paint chips). I will probably keep my HD800 because I respect it, as a technical milestone, a point of reference, and an interesting change of pace, but I don’t see much much head-time in its future. I don’t imagine many people are deciding between these two headphones, so I will stop here. So, this was fun. When I learned that I might be able to review a Vérité, I made sure that I would have an electrostatic headphone ready to go for comparison. I had a notion that the Beryllium driver would need a yardstick for speed and resolution, and after I sold a set of L700 last winter, I knew I needed to give another set of Stax a home. SR-007 vs Vérité is the closest comparison I can make from my stable, when it comes to price parity, although the parity is a bit tricky to establish, due to the mk1 being discontinued. That said, at an MSRP of $2,100 for the SR-007 mk2, the 007 and the Vérité are within spitting distance of each other in terms of price. Add the cost of an energizer/electrostat amp that can drive the 007, and they land on the other side of the Vérité in the price comparison. While on non-sonic topics, let’s also discuss build. The 007 that I have are finished in a handsome champagne anodized aluminum, with plush brown leather cups and headband, and are quite light. Fit occurs via an auto-adjusting elastic strap, which some love and some hate. I am in the former camp, and find these quite comfortable. The Vérité is certainly heavier, but carries itself so well that I can’t declare a clear winner in terms of comfort. The 007 might eek out an extra 30 minutes at the end of a day of listening, but I would be more nervous about damaging them. Let’s get to sound. The 007 and Vérité resolve detail in very different ways. Notes from the 007 seem to coalesce from space, and effortlessly float music into your ears. By comparison, the Vérité makes clear exactly where each sound is coming from, and presents detail in a much more deliberate and dynamic fashion. Transients from the 007 are slightly more liquid than those on the Vérité, flowing between notes, while still affording precise transitions. The Vérité, on the other hand, presents sharper edges to notes, and retreats to blackness, even for fractions of a second, in these inter-note spaces. Soundstage is more physical in its portrayal on the Vérité, and slightly smaller than that of the 007, but is comparable in the precision of instrument placement, if not a bit ahead of the 007. The diffuse and ethereal character of the 007 makes the Vérité’s stage feel more like music is being played, rather than just hovering in the air. I appreciate being able to listen to each note grow and fade in this more dynamic way, as opposed to the more atmospheric presentation of the 007. I am a bit wary of this coming across as a generic comparison of electrostatic versus dynamic headphones, so let me put it this way: The Vérité is, other than maybe the Utopia, the most macro and micro-detailed, fast, and impactful dynamic headphone that I have heard. Because of this, the Vérité stands toe-to-toe with the 007 in many of the areas that Stax usually dominate, for example, absolute speed and resolution. What is left behind in the comparison is the means and character of their resolution, rather than a major quantitative difference, as might be apparent when referencing other dynamics. In terms of frequency response, the 007 has a slightly warm tilt, as does the Vérité, but the former is flatter through the lower mid-range. Due to the airier upper-end of the Vérité, and its crisp speed, the Vérité comes across as less warm than the 007, which brings it quite close to my ideal tuning. Both are exceptional headphones, each with a different take on absurd levels of detail and transparency. I am very grateful to have been able to make this comparison, and think that the 007 and Vérité complement each other quite well. I would be curious to get in an 009 or 009S to see how a Stax with brighter tuning might pair up with the Vérité, but that will have to wait. The Vérité and Aeolus are certainly not in the same price category, but given that the release of two new ZMF headphones invites comparison, and that I have the Aeolus in for review as well, let’s get into it. Build is not really a category that deserves much time. The Vérité is a bit lighter due to the Mg chassis. 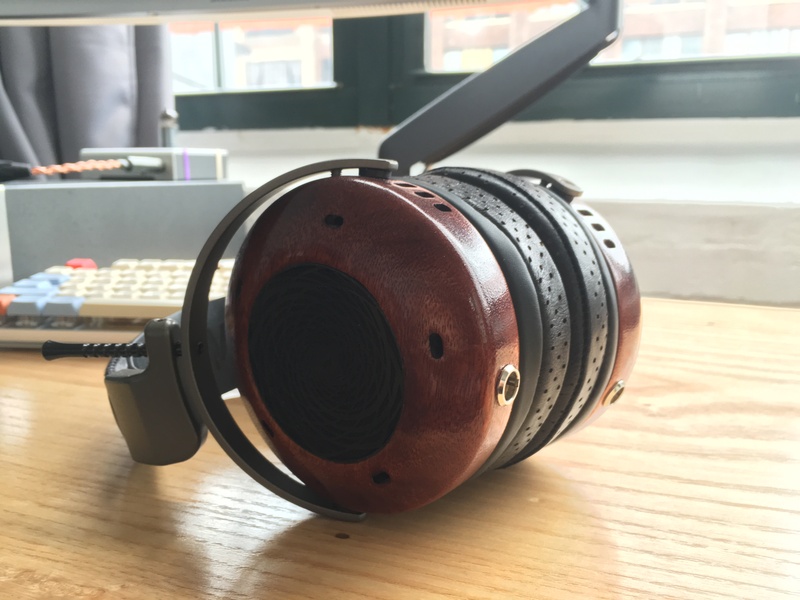 Both headphones are finished beautifully, and built durably. I will go into a description of the Aeolus’ build in its review, coming Soon™. To get right to sound, the Aeolus is just a freaking fun headphone, with a nice jump in technicalities and evenness as compared to the Atticus, that makes it so easy to listen to. More than any headphone in this review, including the Vérité, I found myself bobbing my head, or up and dancing, listening to the Aeolus. It’s not as technically proficient as the Vérité, it’s not as fast, controlled, holographic, or detailed, but it is a massive contender in the ~$1,000 headphone market. The mids on the Aeolus maintain a lush and inviting character that Atticus owners will know well, with guitars and vocals coming through especially in an exceedingly natural way. However, the mids are now transitioned into from a less booming, but still punchy, bass range, and are followed by treble that I think needs just a bit more bite on some classical tracks, but which makes a lot more recordings sound good. I still need to see how the Vérité pads alter the response of the Aeolus, and have a hopeful guess that they will bring the treble to an awesome spot. Compared to the Vérité, all of this results in a headphone that is more friendly and forgiving, but less wowing and engrossing. The Vérité can resolve to an extreme, but would not be my go-to choice for “low-fi beats to study to” (I hope for obvious reasons). Beyond the fact that I would feel a bit guilty ignoring the Vérité, it is good at being the microscope with musicality that the HD800 never was, and the headphone with slam and speed that doesn’t drill detail into your ears with its metallic tuning. The Vérité isn’t a headphone that’s easy to put on the back burner mentally, despite its somewhat down-sloping tuning. Meanwhile, the Aeolus presents a great value for the enthusiast who wants a take on the ZMF sound that is less about absolute technical proficiency, and more about fun. That said, the Aeolus does take a big step toward traditional audiophile characteristics compared to the Atticus, and I think many people will love it for that reason. Yes and no. In terms of technicalities, the Vérité is clearly superior. Transient response, separation, image size and specificity, blackness of background, and overall speed are all better on the Vérité. That said, at the level of resolution that both these headphones occupy, timbre and tuning can play at least as large a role as technicalities in guiding a purchase. These more subjective features are not somewhere that I can predict your preference. I have shared what the Vérité sounds like to me in the context of other headphones, that is, remarkable. If you enjoy both tunings equally, the Vérité is the better headphone. If you prefer the frequency response and general voicing of the Auteur, then the answer is a bit murkier. When it comes to price-to-performance, the value of each marginal dollar can only really be decided on by you, the potential buyer. Given this, I will leave the question of “worth” without a definitive answer. I will say that the Vérité can do things the Auteur cannot, but quantifying that difference, and assigning a dollar-per-unit value, is not something I can do. Wheeeeew. Nine pages of writing later, I’m about ready for a conclusion. The Vérité is an exceptional headphone, built by hand in the USA, after a tradition of quality, community and artistry. I am always excited to see another ZMF headphone come out for these reasons. The Vérité is no exception, and offers the most mature sonics of any headphone ZMF has released to date. The Vérité is not remotely close to inexpensive, but you are paying for the flagship headphone from a company that focuses on handcrafting heirloom pieces, in the US, for the high-end of a niche hobby. Whether or not the cost makes sense for you is not a decision I am equipped or interested in making, but the price is not without reason. To finish up, I will briefly summarize my impressions, in that Zach has done a masterful job balancing the tuning and the technicalities of the Vérité. Their synergy is truly something special, and neither piece tells the whole story. This achievement requires a profound understanding of how we perceive music, and speaks to both Zach and ZMF’s growth. While no headphone can be a universal crowd-pleaser, the Vérité does so much right, in such a unique way, that I can only urge that you make serious efforts to get one around your head, and give the Vérité a hearty recommendation. Thank you to Zach and ZMF for creating these, and sending them for me to check out. I have enjoyed the Vérité a great deal, and appreciate the opportunity to review them. Blommen, WHO23, Overkill Red and 22 others like this. Thanks! Enjoy the Verite. Comparing with the auteur was a lot of fun. And agreed, there is a time and place for detail, but usually not when I'm ready to pass out. Your Stax comparison would been different, If you would have used a much better amplifier like KGSSHV.